Urmson: Google's test vehicles "spend less time in situations where accidents are possible" than well-trained human drivers. YPSILANTI, Mich. -- The head of Google Inc.'s self-driving car program said the company's test vehicles are very safe and noted recent accidents involving them were minor and actually the fault of other drivers, not Google technology. 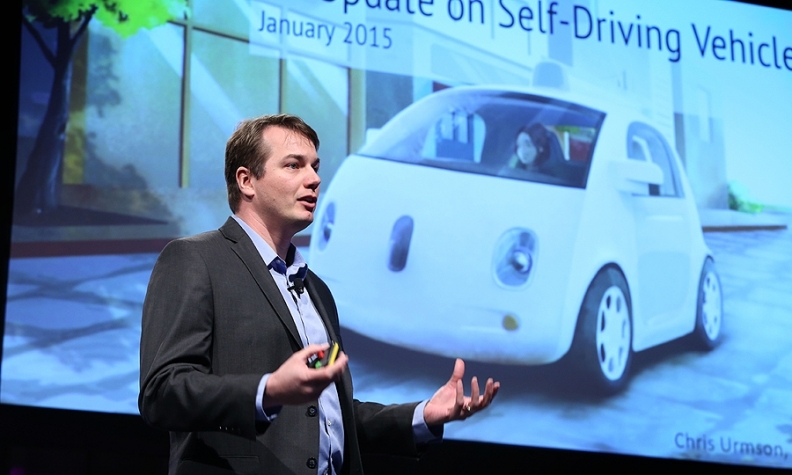 Chris Urmson, speaking at an automated vehicle conference here, also said the laser and other sensing technology that Google is developing will enable its vehicles to see beyond the line of sight that human drivers have, and the technology is able to prevent the kind of situations in which the potential for accidents increases. Google's self-driving cars "are learning the road" in the hours and hours of testing the company is doing, Urmson said. In highway driving, he added, Google’s cars operate at a more constant speed and "spend less time in situations where accidents are possible" than well-trained human drivers. In emphasizing the point, Urmson presented animated data from a Google car's sensors showing how it slowed in highway driving to move out of the blind spots of other vehicles. And while human drivers can lose focus on the road because of any number of possible distractions, self-driving cars will be "paying attention all the time," he said. Urmson pointed out that about 33,000 people die each year in U.S. traffic accidents. On July 1, a Google test vehicle was rear-ended in traffic by a car moving at about 17 mph. It was the fourteenth accident involving Google cars in six years of testing, and was the first in which minor injuries were involved. Three researchers in the Google car reported minor whiplash. The other driver "drove into the back of us," Urmson said during his presentation at this year's Automated Vehicle Symposium. Afterward he said the accident would have happened even if the Google researchers had been in a regular car. The three incidents before that accident amounted to cars lightly bumping Google test vehicles while in traffic. "This is somebody looking down at a cell phone and he rolls forward" at very low speed, Urmson said. Nevertheless, significant challenges remain for self-driving cars -- among them unpredictable situations and "bonehead" moves that drivers, cyclists and pedestrians sometimes make, Urmson said. Animations generated from sensor data in actual test drives showed how Google cars have encountered cyclists veering into the road way, cars pulling out unexpectedly and even a woman in a motorized wheelchair chasing a duck. But Google technology enables its cars to create a bird's eye view of its environment that takes into account objects, vehicles and people that would not be visible to human drivers. In one such video, a cyclist darted through an intersection across a red light. Other vehicles started moving and had to break to avoid the rider. But the Google car had picked up the cyclist in its bird's eye view and, anticipating he would not stop, paused before proceeding.